Google TV is still confused, confusing, and not a very helpful thing to buy into your life. So far, the TV gadgets using it have been mediocre. Vizio's stab at Google TV, the Co-Star, is the best box yet—but will anyone care? A Google TV box that'll stream video, add "smart" searching across live and on-demand content, and add apps and Chrome to your telly. People who need search options that can show you what you want to watch faster than a cable box guide, and people who think their TV should do a lot more than mere TV. The box is just a little black box. Noting special. You could do without the silver ornamentation—these boxes should be invisible. But at least it's small. The remote is a touchpad-and-button crusted brick that's comfortable to hold, but difficult to manage. Too many buttons. Just too many buttons. Unlike Sony's crummy NS7 Google TV, the Co-Star is easy to set up, both physically and with software settings. 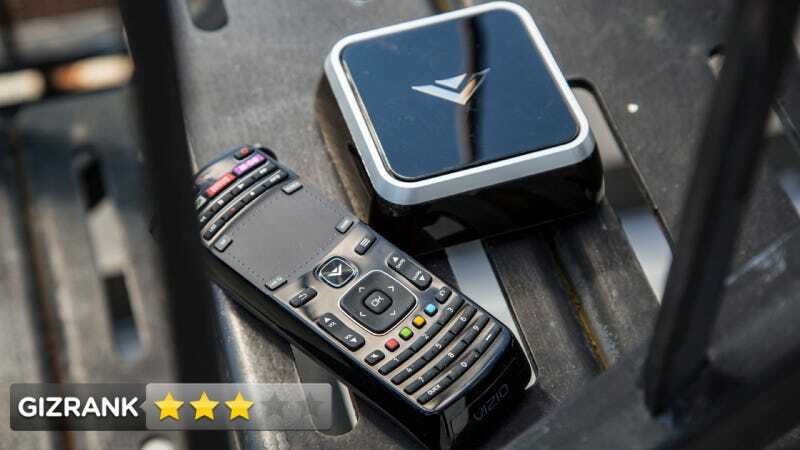 Once you're set up—with the Co-Star working as a central brain between your TV, cable box, AV receiver, and whatever other home theater parts you've got—you'll do everything from the Vizio remote. Power, volume, channels, searching—it's all done from the buttony brick. Vizio kept the interface clean, leaving off annoying skins and half-baked customizations—and it's smoother because of it. The remote. No remote in 2012 should look like this. The solution to controlling a device that does a million things isn't a remote with a million buttons. Google (and Vizio) still thinks that Chrome belongs on a TV. Nobody wants to use Chrome, Firefox, Safari, or Web TV on their set. It just doesn't work. If you're absolutely sold on Google TV as a platform, this is the best Google TV device. It tries. It does it pretty well. But Google TV, despite its strength is as a search platform, is still more convoluted trouble than it's worth—no matter how admirable Vizio's attempt is. Until Google TV becomes fundamentally better, no iteration is going to be anything better than king of Meh Mountain. While you wait for Google TV to improve, you can still find an intelligent streaming box with more ways to find things you like. Heard of Roku?